A romantic, contemporary fable, SALMON FISHING IN THE YEMEN is the tale of government employee Dr Alfred, or Fred, Jones (Ewan McGregor), a rather introverted scientist at the Department of Fisheries and Agriculture. 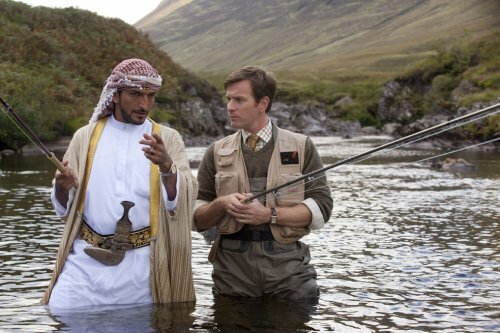 Trudging along in his day job, with his marriage stagnating, his world is suddenly thrown into turmoil when he’s drawn into a scheme hatched by a fly fishing-obsessed Yemeni Sheikh (Amr Waked) who dreams of achieving the seemingly impossible — introducing salmon to the wadis of the Yemen. When the British government, desperate for a good news story in the area, gets wind of the Sheikh’s plan, the Prime Minister's fearsome spokesperson, Patricia Maxwell (Kristin Scott Thomas), seizes on the idea — it’s a good news story that will deflect attention away from the government’s latest blunder. She appoints Fred to oversee the project, which pleases him not at all. For a logical, rather stuffy scientist like Fred, the idea of introducing salmon to the Yemen is one step short of madness. Fred, however, is eventually won over by the charismatic Sheikh and his mystical worldview, while he also begins to fall for the Sheikh’s representative, Harriet Chetwode-Talbot (Emily Blunt), a gentle and engaging English beauty who joins on him his journey into the Yemen. When Fred is drawn into helping Harriet try and fix the troubles in her life, he learns to cast off his deep-set cynicism. With Emily’s encouragement and support, Fred then rises to the Sheikh's eccentric challenge, and embarks upon a journey of self-discovery and late-blooming love.